We haven’t been watching movies much lately, what with the rich, fulfilling lives, the engaging careers, the geohashing junkets, and the relentless, relentless blogging. But when I saw that Mrs.5000 had gleaned a list of films after reading some of the “Best of the Year” articles in January, it occurred to me that it would be fun to get back into the movie reviewing game. Oh, and also to enjoy some filmed entertainment with my wife! So, I confiscated her list and starting placing holds at the library. 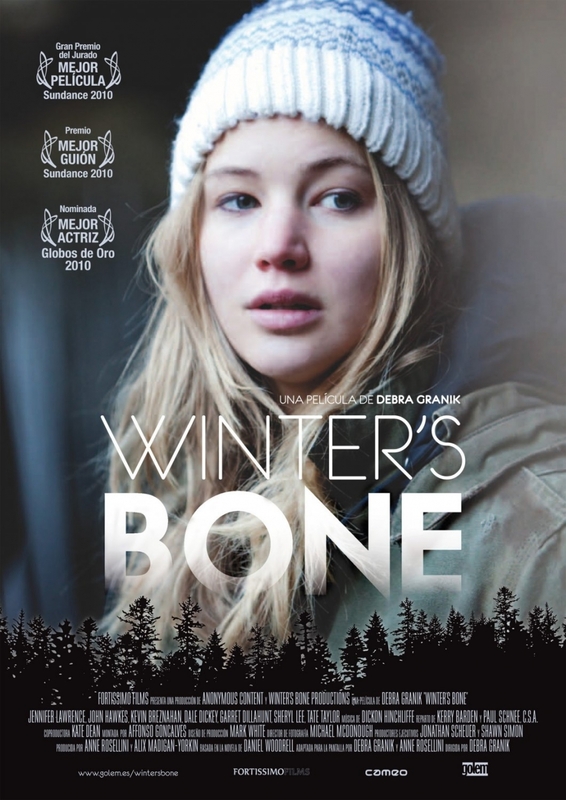 In Winter’s Bone, a young woman trying her best but with few resources to care for two children and her disabled mother engages in a long and dispiriting quest to find her missing father. It is a kind of Odyssey (or Telemachiad, if you want to get all technical) set against a background of relentless rural poverty, domestic dysfunction, and drug crime. Mrs.5000 tells me that it was a common critic’s pick for the best movie of 2010, and I am sure that many critics enjoyed the excellent acting and vivid invocation of a dystopia-is-now backwoods Missouri. The academically minded probably found it intriguing to watch Granik deploy many of the elements of the Western and Noir genres in a new and unusual setting. And no doubt many people saw the movie as giving attention to America’s Forgotten Rural Poor. While recognizing these virtues, I was not by any means smitten by the film. For one thing – and to be fair, this comes from a guy who has been mostly watching Indian movies lately – I was immediately struck by Winter’s Bone’s brazen refusal to entertain. Its opening sequence feature a one-voice a capella rendering of a mournful old folk tune, while the camera beautifully frames a shabby rural cabin in front of which children are passing the time: jumping on a trampoline, skateboarding, playing with a dog. Did this go on for several minutes, or did it just feel like it? “The backlands of the Ozarks… is established with bleak economy in the opening scenes,” writes Ebert, which is code for “nothing much happens for the first ten minutes.” All that bleak economy sets a mood – grimness – very effectively, but it also announces as with a flourish of trumpets that the next 90 minutes will be a bit of a long haul. Now this is not my first rodeo, and I am very aware that there is a legitimate artistic tradition of movies that do not pander to our basic instincts for entertainment. I often like them. Such movies are generally associated with an implicit "social message,” as we say, and in this case, the filmmaker very likely thought her message was “look at how American society has failed its rural poor.” The message that actually comes across, unfortunately, is “America’s rural poor is batshit crazy; keep your doors locked and stay on the interstate.” And as a rural bumpkin by upbringing, I kind of take offense at that. “There is a hazard of caricature here,” says Ebert, “Granik avoids it.” Personally, I felt she rather wallowed in it. In the world of Winter’s Bone, every second shack in the woods is a meth lab, and every poor person is, like a movie cowboy or a movie detective, following a code of honor that must be obeyed even if it leads one down a path of personal destruction. The former is a reasonable dramatization of a real social problem, but the latter is a slur: poor people are poor, not stupid. If you watch Winter’s Bone, keep this in mind as you watch the protagonist navigate the mysterious social world of these Ozarks, talking to people who might talk to people who might arrange for her to talk to the people she really wants to talk to, if she follows the proper protocols. It’s as if she’s navigating the Papal court. It’s all very gritty and foreboding – but, if you take a step back and think about it, it’s also pretty silly. Similarly, if you watch or have watched the film, consider the legal premises that drive the plot. I’m no expert in Missouri law, but I am awfully confident that the problem confronting our heroine is a non-starter, at least on the timeline implied. And I am quite sure that its quick resolution, with a messy package tossed across a sheriff’s desk, would not clear the matter up in any universe that you or I are familiar with. Also, check this out: although the protagonist visits a large high school, a friend’s ranch house, and a sheriff’s office, and although it is established that she is within a child’s walking distance of an elementary school, we are rigorously kept from seeing the town that must contain these beacons of civilization. That absence retains the mood, but it also inserts a pretty big fib into the story. If we saw the town, after all, we would get to wondering why our heroine isn’t plugged into the town’s resources – getting food stamps, say, or checking in with a friendly social worker, perhaps working at the five and dime, perhaps working on a G.E.D. We might wonder whether this failure to engage might mean she was following a code of honor that must be obeyed even if it leads her down a path of personal destruction. This would complicate the movie, because we are supposed to see the heroine as smart and resourceful. When you realize that she lives on the edge of town, instead of 35 miles up some remote hollow, she suddenly seems maybe a little less smart, but definitely a whole lot less resourceful. So if it is not an enjoyable entertainment, neither is Winter’s Bone really any great shakes as a social document. And finally, it is not really all that great in conjuring up the nightmares of poverty, either. It overreaches. The level of despair and pointless destructive behavior is hyperbolic. It reaches a climax that involves the mutilation of a human corpse with a chainsaw. No, really. I guess this scene is supposed to represent a culmination of futility and horror. I found it laugh-out-loud funny in its perverse sensationalism. After that dark, unintentional joke, the end of the movie (which features, incongruously, a happy reversal of fortune right out of the Victorian novel) is pretty hard to take seriously. Prognosis: * * Recommended for people who groove on good cinematography, for genre mavens, and for people who feel a sense of personal virtue after watching a gloomy movie about poor people. Potentially useful for starting discussions in classes on Rural Sociology, Bond Law, or Introduction to Social Work. Beautifully made, but not very good. If this was the best movie of 2010, I picked a good year to check out. The main thing I remember about this is that Jennifer Lawrence got an Oscar nomination for her role in this. I believe the movie was awarded Best Film at the Sundance Festival; needless to say, I was not on the jury that year. I completely agree with your first paragraph, at least what the critics said. Wife and I lived this movie, and I'd never even considered the Telemachus parallels; now I even like it more! You make some solid points about the exaggerated lack of civilization, none of which I thought about during the movie. I was was too busy being fully captivated by the great acting, constant tension, fantastic dialogue., and general creepiness that gave it all the attributes I like in a film noir, but in a new environ that unexpectedly fit. I do admit to being a sucker for gloomy movies, although they needn't be poor people. I'm very egalitarian in my dispersion of gloom and am just as happy to see a depressing movie about rich people in the suburbs. But I do love me a dark movie and this would probably by favorite movie from that year (not that I saw too many). Thanks for the rebuttal. I always like getting the other side of the picture. Element of the Month: Zirconium! Saint of the Month: Saint David of Wales!